Wagyu superior meat flavour and texture arise from the presence of a high amount of oleic acid, a monounsaturated fat distributed throughout the meat, rather than being laid down as subcutaneous deposition. It is this which gives it its "marbled" appearance. This fat has been found to contain twice as much monounsaturated fatty acids as any other breed, and has the effect of lowering blood cholesterol. Latest research also suggests some of these fatty acids actually reduce the risk of cancer. Aside from the health benefits of wagyu beef, when it is cooked, the distributed fat heats up and helps to cook the beef evenly. The unique Japanese Wagyu has the ability to increase marbling more rapidly than any other breed found in the world. 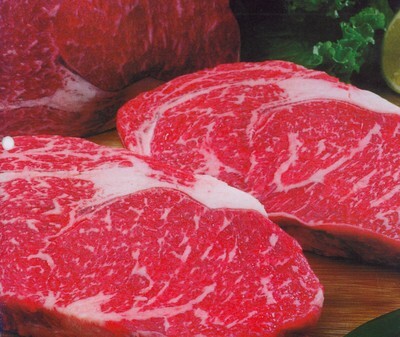 Leading chefs actively seek out marbled beef, this being the visible criteria which indicates excellent eating quality. Wagyu beef's flavour and succulence place it in a class of its own in eating enjoyment.